You may have reached this page hoping to find information about titanium mining in World Of Warcraft. Although I'm a big fan of Blizzard myself, my area of expertise is really about real life titanium ore, titanium metal and all titanium applications you can think of. However, I do like to excel at anything I do, including World of Warcraft. If you are the same, and if you're not, then you should be, as the world really needs more people adept at what they do, and you need to find something to give you that extra edge in WOW, there is something you can get to achieve that. It is called Warcraft BluePrint and it shares my titanium approach - "The greatest secrets of World of Warcraft EXPOSED !" - The secret to boosting your gold count faster, even while you’re farming! - Small adjustments you can make immediately to optimize your gold making speed. This works so well it puts your gold generating skills on steroids. - 5 tools all expert gold makers use that you must have in your arsenal. - Never get cheated again with this detailed price list for ores, herbs, potions, and much more. - Running out of gold when you need to buy gear? Use these maps to trace secret sources of high demand items such as rare furs, herbs, ores, fish and other items. - How to access some of the richest ores available in WoW. Need Titanium, Thorium, or Cobalt? Use this section to get unlimited supply. - Shockingly undervalued ores that are in high demand and how to flip it for fast money. Get your WOW Secrets Exposed report now! If you're interested in real titanium, let's move along. Titanium in the form of metal and dioxide is obtained through titanium mining from titanium ore such as rutile and ilmenite, leucoxene described as mineral sands, usually found in beaches and dunes along the coasts. To mine for these minerals, sands are dredged through a large suction pipe, and the heavy minerals are separated out from the lighter sand particles. As the dredge moves slowly forward, the clean sand tailings are pumped back to fill the mined area again. The mined minerals are sent to mills to be separated from one another using electrical and magnetic techniques. To obtain pure, white titanium dioxide, the minerals are reacted with chlorine then burned in oxygen. Titanium ore occurs as sand grains mixed in with lighter clays and quartz sand grains. Within the ore body, less than 5 percent of the grains may be heavy minerals. Above the ore body is the overburden of clays and quartz sand without marketable product. Titanium mining uses two main methods: suction dredging and auxiliary mining. In the suction dredging method, an electrically powered suction dredge floats within a 15- to 20-acre man-made pond. At one end of the pond, the dredge draws in overburden, titanium ore and water and transfers the mixture to a floating wet mill. Vibrating screens block out roots and other large objects. Spiral centrifuges are then used to concentrate and separate the heavy mineral sands from the lighter clays and quartz sands. The now 80 percent heavy mineral concentrate is then pumped to a stock pile area before being transported to a plant for further processing. 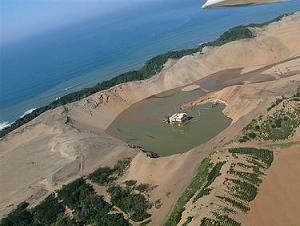 The tailings of clays and quartz sand are discharged back into the pond behind the suction dredge. As the dredge moves forward, the area behind the dredge is recontoured, covered with topsoil, and revegetated to meet reclamation standards. Auxiliary titanium mining is used in locations that are not suitable for suction dredging. The overburden is removed with heavy earth moving equipment and stock piled for later use in reclamation. The titanium ore body is then loaded on to trucks and hauled to an area in front of the suction dredge. The suction dredge than processes this material as described above. Tailings from the suction dredge are pumped back into the auxiliary area to back fill the mined out pits. The auxiliary areas are then backed filled with overburden, recontoured, covered with topsoil, and revegetated to meet reclamation standards. The largest titanium operations are currently located in South Africa, Canada, Australia, Norway and Ukraine There are only three U.S. states currently producing titanium minerals Florida, Virginia and Colorado, with the latter holding the largest titanium ore resource in the United States.